Britain's only prehistoric mummies resided in Cladh Hallan, only Scotland's South Uist island. They belong to a class of mummie known as "bog bodies," corpses naturally preserved in sphagnum bogs. A new discovery reveals that these mummies — one male and one female — aren't unusual just because they're British; they're also each made from the composite remains of multiple people. Cladh Hallan mummy photo from the University of Sheffield. 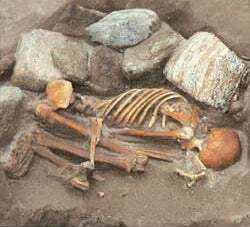 The mummies, which were buried 300 to 600 years after their deaths, were discovered in 2001 below what were once the houses of Cladh Hallan, an 11th-century Scottish village. Archaeological researchers, including Terry Brown at the University of Manchester and Mike Parker Pearson of Sheffield University, have long noted abnormalities in the female skeleton, such as a jaw that didn't fit the rest of her skull, and decided to DNA test several of the bones to get a clearer sense of whom these mummies were made of. These turned up DNA from different people contained within each mummy — people who don't even share the same mother. The women who make up the female body appear to have died around the same time, while the men from the male body died a few hundred years apart. The researchers aren't sure why the mummies were made from multiple bodies — or even if this was a deliberate merging of bodies or just an occasional replacing of body parts. But they do have a sense of the process, one in which the villagers tried to attach the bones together just as they would naturally appear on a single, intact body. Head over to National Geographic for more details on the preservation process of these mysterious melded mummies. A paper about the findings regarding the female skeleton will appear in August's Journal of Archaeological Science.